Catching puppy fever? See a dog and can’t help but stop to pet it? Wondering if you should take the plunge? 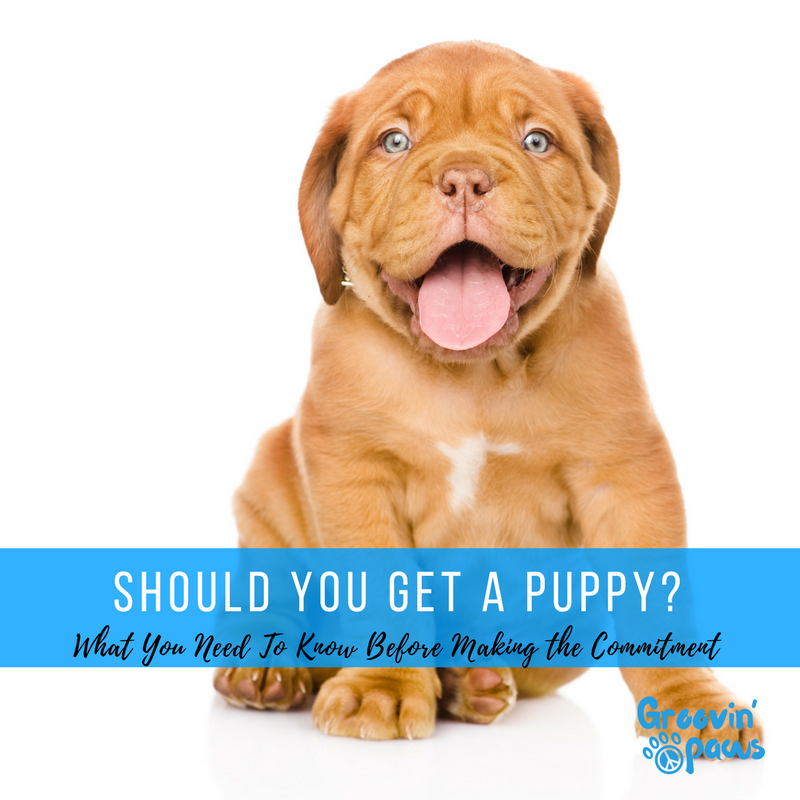 If you are someone who is experiencing puppy fever, or if you just convinced yourself to adopt the sweetest puppy from Charleston Animal Society, you will want to read this FREE professional advice. We understand adding a dog to your family is a big decision, so we paired up with Canine Revolution Dog Training to cover the most important things you need to understand before bringing home a new puppy or dog. Keep reading to find out how to best transition your new furry friend and establish a lifelong relationship! Q: What is the first piece of advice you would give someone who is about to get a puppy/dog? A: For anyone who is wanting to get a dog, especially a puppy, I always recommend that you have a goal (or vision) in mind of what you would like your relationship to be and why you want to get one. This could range from a companion pet, to a sport dog, protection dog, service dog, emotional support dog, therapy dog, etc. The main thing is to have a vision, or goal, of what you want that relationship to look like and then a detailed plan on how you will get there. Just like with humans, teaching a dog behaviors and manners doesn’t happen overnight, and requires a plan and consistency. This should also include the amount of time you have available to fulfill the needs of a dog or puppy which should include daily physical exercise and some type of structured mental stimulation. It is important to note that just putting your dog out in the backyard for an hour is not the type of exercise I am describing here. I’m talking about a structured exercise regime that you lead your dog with, such as walking. Additionally, we should consider providing the vital resources your dog needs: food, water, shelter, medical attention, and the costs that go along with these, not to mention costs of acquiring the dog/puppy. I can tell you from personal experience, those emergency vet visits seem to happen at the most unexpected times! Q: Does a first-time dog owner need to prepare their house before bringing home a new puppy or dog? A: Absolutely. This is where we get into the detailed planning involved with your goal for your dog. Even if you are not planning to do high arousal activities with your dog, such as sports, the concepts about bringing your puppy or dog home are the same. We all want a “potty trained” dog and a well-mannered dog. These both require consistency on the dog owner’s part but also involve some preparation at the house. You will need the “equipment” to establish a proper relationship with your dog, a relationship that should be founded on trust and respect. A very basic “equipment” list should include: crate/kennel, food/water bowls, leash, collar, food, high-value rewards, self-entertainment toys, and engagement toys. Dependent upon your specific goal with your puppy or dog, you may need to add to this “equipment” list. It's important for dogs to spend time without their owners and this is where self-entertainment toys are useful. I recommend a type of treat dispensing toy for self-entertainment. When I advise new puppy or dog owners on how to set up their home, I recommend to establish a neutral area for the dog. This is where the kennel/crate, and possibly a doggy pen, come in. The kennel should be seen as a positive place by your puppy or dog, we make it positive by playing crate games, feeding dogs in the kennel, and never using a kennel for punishment. Doggy pens are great for establishing neutral space in family areas, but still maintains boundaries for the puppy or dog to abide by. Q: What "house rules" should you establish? A: I recommend that the members of the household come together and create a set of “house rules” that they want with their puppy or dog. These “house rules” should be implemented from day one, because as soon as a dog enters your home, they are already learning from the environment and from their interactions with the family. Some useful house rules could be: -No jumping up on humans -No jumping up on counters -No leash pulling -No running out of open doors -No overboard barking -No biting (teething, chewing, etc.) -No digging -Being civil with other dogs -Coming when called -Staying when asked. Again, these should be determined by your family. There may be differences between two family’s house rules and that’s okay, but we do need to provide that structure to our dogs. Q: How long does it take to get your dog "housebroken?" A: House breaking (also known as potty training) consists of three main points: Structure, Supervision, and Schedule. The amount of time it takes to get your dog “housebroken” solely depends upon you as the dog owner! Structure is the boundaries and rules we set for our house. One of these rules may be no “free feeding.” If we free feed our puppy or dog, there is no telling when they may have to go potty. Supervision involves not allowing our puppy or dog to have “freedom to roam” in the house. If the dog can roam freely without owner supervision, he or she can easily potty anywhere at anytime without the owner knowing. Keeping our puppy or dog on a leash with us as we move throughout the house or in a neutral area will help to establish this mindset. Schedule relates to being consistent with allowing your puppy potty breaks. The length of time between your potty breaks should correlate to your puppy’s age and size. An 8 week old puppy may need potty breaks every 1-2 hours, a 4 month old puppy should be able to hold their potty for 4+ hours. You will come to learn how your dog is in controlling themselves as you progress with them. When a young puppy first comes home, I recommend getting up 1-2 times per night to allow the puppy a potty break. If the puppy has even one accident in the kennel, it will not help you to get through the potty training stage. As time goes on, these nighttime potty breaks can be reduced until they are no longer needed. Additionally, I recommend a short walk at night before bed to help the puppy flush out their systems. A 10-20 minute walk should be plenty of time to allow the puppy to work everything out of his or her system. Q: Is it important that you get a dog who matches your lifestyle? A: Yes, once we have a goal or vision in mind for our dog, we should take a look at the type of dog that may be the best fit. This isn’t necessarily breed specific. While yes, in most cases the breed generalizations can be fairly accurate, it isn’t always true. You may not get a German Shepard that likes balls or you may not get a Basset Hound that is “chill.” Each dog has their own personality, just like humans do! I personally know a miniature poodle who enjoys long bike rides where he runs next to the bike. Q: As a professional dog trainer, what is the most common question that your clients ask you about puppy behavior? A: When talking about puppies specifically, many dog owners ask me about a puppy who is “biting” them non-stop. If you’ve ever had a puppy, you know what I’m talking about- the puppy biting your pants, shoes, hands, arms, legs, etc. This behavior originates in the puppy’s litter as they play with their litter-mates. The lessons that a puppy learns while it is with its litter-mates and mother are crucial for its development. The “biting” behavior starts when the puppies begin to play with one another, however if they begin to “bite” on the mother, she will show them that is not acceptable with either a snarl, snap of her teeth, or growl. A mother with a litter understands her role is to be their guardian and leader, not their friend. With that said, when a puppy comes to its new home, he or she oftentimes demonstrates this “biting” behavior on the humans of the household as well, simply because they do not know what the conditions are for interacting with humans. I teach my dogs, and all the dog owners that I work with, that we should not allow them to “mouth” us. This is because the dogs need to understand that there are limitations of the physical interactions between human and dog, we do not want to put ourselves in a situation where our dog may be reading our body language incorrectly, especially with a signal sensitive dog. Our dogs should respect us to the point where they will not put their mouth on us, even in a gentle way, so that we can preserve this good behavioral habit in the future. It is solely our responsibility as dog owners to show and teach our dogs this behavior. This is even more important with those dog owners who have babies or children, are expecting them, or are planning for them in the future. Q: If you could leave our audience with one last piece if advice what would it be? A: I would advise any dog owner, present and future, to ensure that you are providing for your dog’s very basic instinctual needs: daily physical exercise and daily mental stimulation. My preferred method of daily exercise is a nice walk twice per day, at least 30 minutes each. However, a game of focused fetch with your dog can also be a great way to exercise. Other options may include, conditioning your dog to treadmill (this comes in handy on those super rainy days! ), conditioning your dog to walk next to you on a bike or rollerblades, hiking with your dog, swimming, etc. Get outside and have some fun with your dog! There are many parks in Mt. Pleasant and the greater Charleston area to allow for a great time. For mental stimulation, I like to teach my dogs new things, like obedience work or engagement games. To really get your dog’s mind working, train with high-value rewards by marking and rewarding your dog for the desired behaviors that you desire. If your desired behaviors are more complex, such as a “down-stay,” break up the behavior into several segments, teach each segment separately, and then put them together. A separate, but extremely important, piece of information for dog owners is to ensure that you are properly socializing your dog. Yes, socialization is very important for puppies 0-6 months of age, however it should not stop there. Socialization should be continued for the life of your dog. Unfortunately, I see and deal with many dogs who were socialized improperly. It is a myth that socialization means your dog should directly interact with as many other dogs, animals, and people as possible. This couldn’t be more false. Socialization is providing your dog with positive experiences in proximity to people, places, things, animals, etc. Not direct interaction. This is because the way you and your dog perceive the world are two different ways. A person bending over saying “HEY!” to a dog could be perceived as aggressive by your dog (think about showing teeth i.e. smiling). Your dog interacting with strange dogs then getting bitten could develop into aggression later in life. These types of negative interactions happen all the time at dog parks and other areas that lack an overall structure and leadership, so be very careful on the type of environments and situations you put your dog into. I like to play engagement games with my dogs in new environments for socialization, it should be both a fun and positive experience you and your dog! Contact Canine Revolution Dog Training for a FREE consultation!